This Sausage, Peppers, and Onions dish is an easy weeknight meal. This recipe can be frozen ahead and cooked in a slow-cooker. 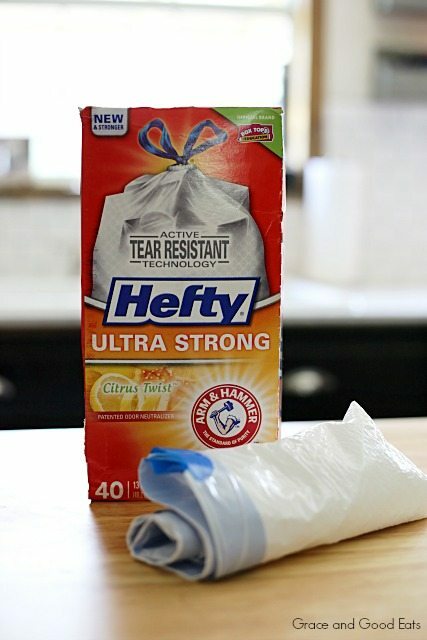 This is a sponsored post written by me on behalf of Hefty® Ultra Strong™ trash bags. There’s a running joke between firefighter wives that if something is going to go wrong, it will ALWAYS be the day your husband is on shift. I can’t even count how many times this has proven to be true since my husband became a firefighter. James works a 24/48 so he is on shift for 24 hours straight and then home for two days. When you do the math, it equates to only about nine days a month. You would think that would work in my favor, but it is comical how things always seem to go awry only on the days he is at work. Anything from air conditioners that suddenly stop working, surprise rodents in the house, to trips to the ER with a newborn. I’ve definitely learned that I can stay strong and keep my cool when I need to step up to handle something on my own. Most recently… our freezer went out. Of course he was on shift. Of course I just went to the store! By the time I realized what had happened everything in our freezer had thawed. It was awful. Gallons of ice cream, loads of frozen fruit, a huge package of salmon… all straight to the trash. 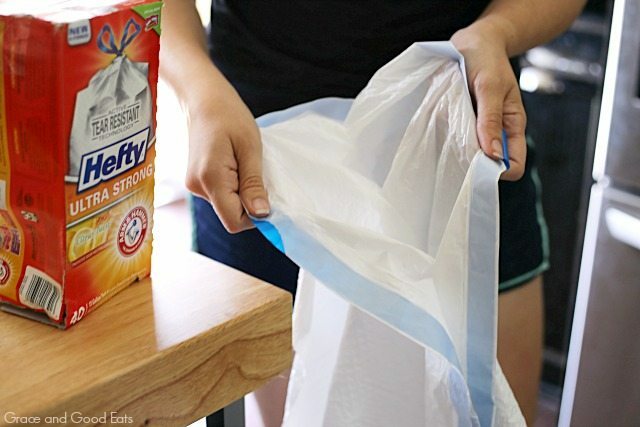 Enter Hefty® Ultra Strong™ trash bags to the rescue. It made me sick to have to throw all of that food in the trash. Thankfully I was able to save a small amount of the food still in the refrigerator by moving it to my TINY office fridge. The important things like cheese, kombucha, and cookie dough. You know, the essentials. I was glad I had a full box of Hefty® Ultra Strong™ trash bags when I needed them. I trust Hefty® brand because of their 100% satisfaction guarantee. (Either Hefty® can handle all your trash bag needs or they will give you your money back.) Plus, I think the commercials with John Cena and Carol Cena, his real-life mom, are hilarious. Carol proves that mom knows best when it comes to ultra-strength and ultra-savings. A lot of what I had to toss was in boxes and oddly shaped so I really got a chance to test the puncture-resistance of the active tear resistant technology. I also put the ARM & HAMMER™ patented odor neutralizer to work, because, of course, it wasn’t trash day when this happened either. 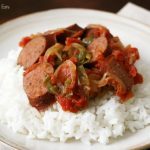 I made this Sausage, Peppers, and Onions recipe with Italian sausage because it’s what I had on hand, but you could use smoked sausage if you prefer. We served it over rice, but this would also be yummy inside hotdog buns! 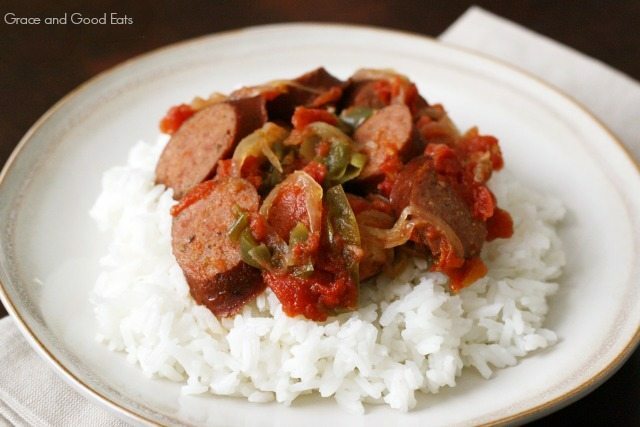 Serve this dish of sausage, peppers and onions on a bed of rice. Place all ingredients in a freezer bag, mix well, freeze until ready. Serve on warm hot dog buns or with rice. Looking for more slow cooker recipes? Be sure to check out my favorite 10 Freezer Slow Cooker Meals. 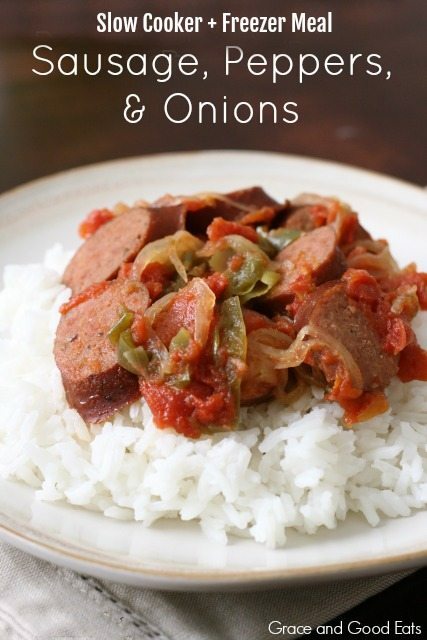 I would like to do your sausage, peppers and onions recipe. I need to make it for 18 people . Can you adjust the recipe for me so I will know how long to cook in microwave……or I could do 4 of these individual bags and then put in microwave. This will be part of of a buffet and I’ll be having lasagna and chicken also. I’d like to sign up for your recipes but it’s only me now. I’m an 83 year old widow. Let’s have this again soon!